Wahama freshman Victoria VanMatre (23) defends Hannan’s Pammie Ochs on the interior during the second half of Friday night’s girls basketball contest in Mason, W.Va.
MASON, W.Va. — A long time coming. 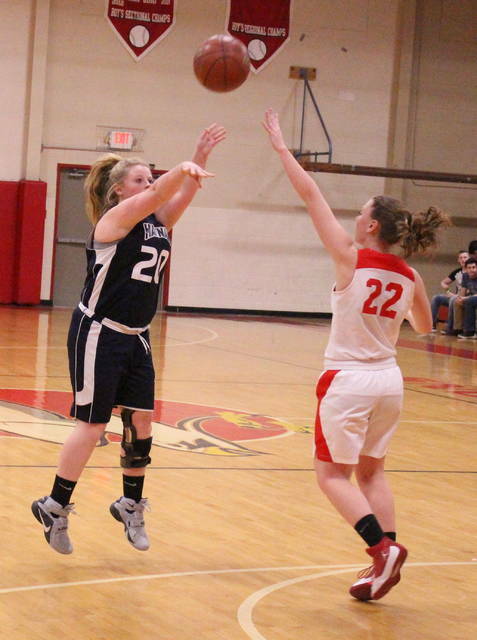 The Wahama girls basketball team had seven players reach the scoring column and held visiting Hannan to just 19 percent from the field while claiming its first winning streak since the 2011-12 campaign on Friday night during a 67-27 decision in a non-conference matchup between Mason County programs at Gary Clark Court. 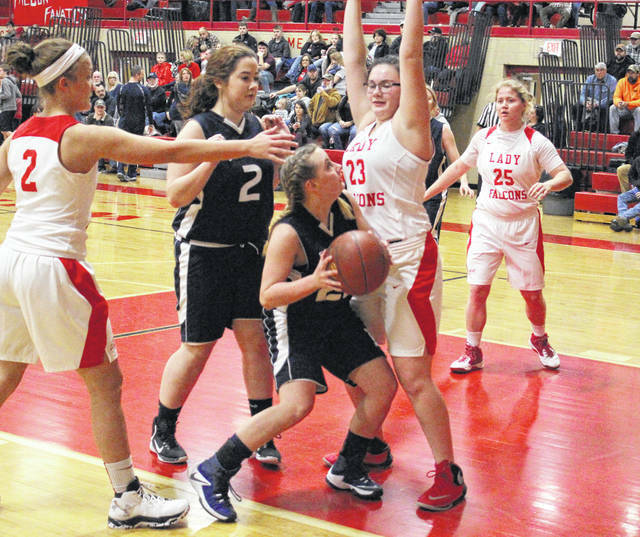 The Lady Falcons (3-5) eclipsed last year’s win total and shot 48 percent from the field in the process, as the one-two punch of Hannah Rose and Emma Gibbs — a sophomore and a freshman — respectively scored 45 points in their second straight triumph. After a scoreless opening minute, the Lady Cats (1-7) did manage to strike first as Josie McCoy have the guests their only lead of the night with a basket at the 6:45 mark. The Red and White, however, countered by forcing 11 turnovers en route to a 17-1 charge over the final 6:12 of the opening canto … and Wahama ultimately never looked back from there. The Lady Falcons shot 57 percent from the floor the rest of the way, and Rose scored 16 points during a 22-12 second quarter surge that allowed the hosts to secure a commanding 39-15 cushion at the break. The Blue and White committed 17 turnovers and attempted 15 shots in the opening half, though things did improve slightly over the final 16 minutes of play as the guests had only 10 miscues to go along with 37 floor attempts. Hannan, however, was never closer than 22 points down the stretch and reeled by as many as 43 points (67-24) with 2:03 left in regulation. 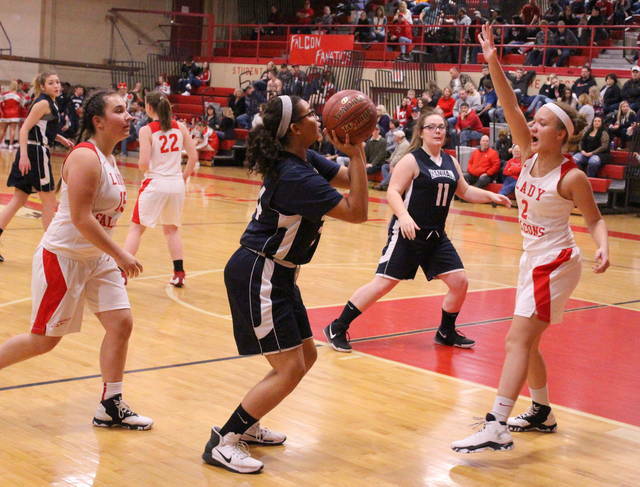 Gibbs scored seven points as part of a 17-7 third quarter run that gave the hosts a 56-22 edge headed into the finale, then Wahama closed regulation on an 11-5 run to wrap up the 40-point outcome. The Lady Falcons outrebounded the guests by a 43-24 overall margin, which included a 14-8 edge on the offensive boards. Hannan also committed 27 of the 47 turnovers in the contest. Wahama has now won two straight decisions over Hannan — both at home — after dropping the previous seven outcomes. Afterward, WHS coach John Arnott was pleased with the overall effort from his troops as they prepare to head into the stretch run after the new year. In dropping its fourth straight overall decision, including a loss to Green just 24 hours earlier, HHS coach Kellie Thomas really couldn’t find many positives in the Lady Cats’ performance. The Lady Falcons made 28-of-58 field goal attempts, including a 1-of-4 effort from behind the arc for 25 percent. The hosts were also 10-of-17 at the free throw line for 59 percent. Rose poured in a game-high 30 points in just three quarters of play, while Gibbs chipped in 15 points and a game-high 16 rebounds. Harley Roush and Natalie Rickard also had seven markers apiece for the victors. Victoria VanMatre was next with four points and eight caroms, while Elizabeth Mullins and Gracie VanMeter rounded things out with two points each. Hannan connected on 10-of-52 shot attempts and went just 1-of-17 from three-point range for six percent. The guests were also 6-of-13 at the charity stripe for 46 percent. Bailey Tolliver paced the guests with nine points and Bailey Coleman contributed six markers. McCoy, Lindsey Holley and Julie Frazier completed the Blue and White tally with four points apiece. 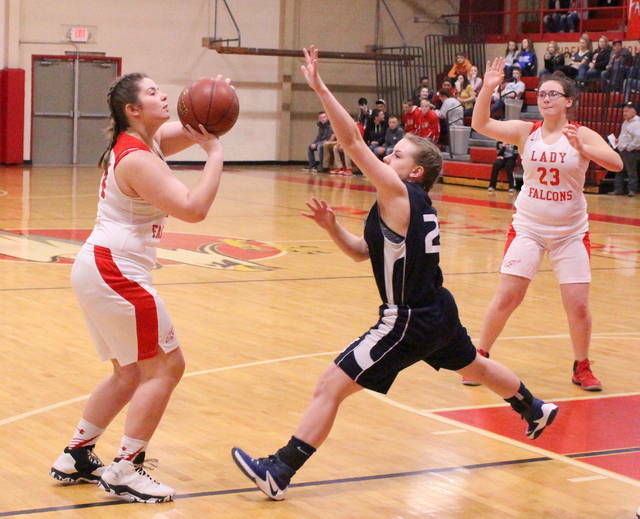 Frazier hauled in a team-high eight rebounds and Halie Johnson also grabbed five caroms. Wahama returns to TVC Hocking action on Thursday when it travels to Belpre for a matchup at 7:30 p.m.
Hannan returns to action Wednesday when it travels to Buffalo for a 6 p.m. contest.